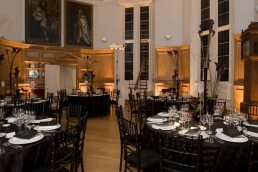 Located in the heart of the UNESCO World Heritage site at Greenwich, the National Maritime Museum’s four unique venues provide a tranquil setting for any event, whilst being only 20 minutes away from the hustle and bustle of the city centre. Situated on the hill in Greenwich Royal Park, the historic Royal Observatory commands breathtaking views of the City of London and the River Thames. The Observatory is home to Greenwich Mean Time and the Prime Meridian of the world, and houses one of the world’s finest collections of time-related scientific instruments, including the famous Harrison timekeepers. Within the historic Flamsteed House, sits the charming Octangon Room, the last surviving interior deigned by Sir Christopher Wren. This elegant enue is ideal for high profile corporate dinners and receptions. Guests can enjoy spectacular views across London and gaze at the stars with a private telescope viewing after dinner.